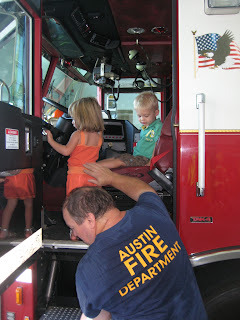 The kids and I headed to Austin a couple of weeks ago and invaded our friends Jenn & Ansley's house. We packed more outings into two days than we've done the entire time back from our Iowa trip! After our little Texas Tornadoes blew through Ansley's toy room, we packed up and headed to Tuesday Kids Night at the Nutty Brown Cafe. If you haven't been there, it is an Austin gem! The expansive patio is shaded by huge Live Oaks and surrounds a gigantic bird cage which houses a large talking Parrot named Cheeto. On one side of the patio is a sandbox the size of our backyard for the kids to play in and on the other side there is a stage with live local musicians jamming out. Kids night (every Tuesday night) featurs silly children's songs and kids ate for 99 cents! It was a blast! We Cleared Out the High Chairs! The late night of dancing and getting down and very dirty in that sandbox did not deter this bunch from waking up with the sun the next morning. 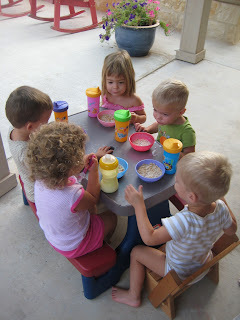 So we ate some cereal al fresco and planned another fun day. 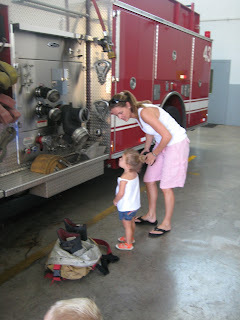 Jenn suggested checking out the fire department down the street from their house to see if they'd let the kids get a close look at the fire engines. 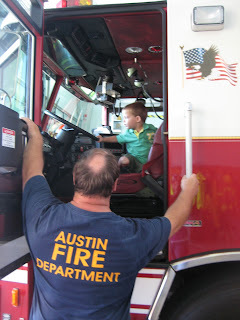 The fire fighters were so gracious and let us play in the garage for quite a while - everyone taking turns driving and riding in the back of the truck. Them to Pose for a Group Shot! 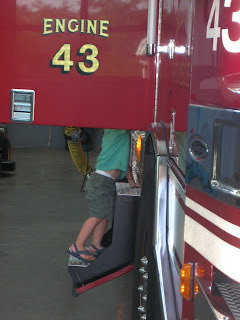 After the fire trucks, we went to play at the park. Then headed home for lunch & a nap. The pool was next on the list. Unfortunately there are no pictures at the pool - I haven't figured out how to relax enough while they are "swimming" to take photos around the water! It was a fun trip and we can't wait to do it again. Jenn, thank you so very much for letting us crash your pad. I know we left you with a million messes and toys hidden in places you never thought of! You and Ansley are such sweet friends and we miss you terribly! Please come visit us soon! Aww what sweet photos. I am glad you were able to get out and have a wonderful time with your good friend. 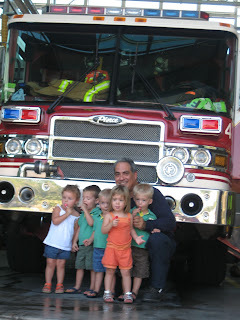 I'm thinking your friends enjoyed every moment of that visit (no matter the messes or where toys ended up). They all look like they had a great time. Love to all of you. Aren't good friends awesome?! 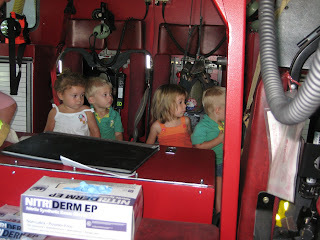 What a great idea going to the fire department....I bet the "heroes" had a great time showing them the firefighter ropes. Let me know when the swimming scene gets easier. I'm sure the incident at the reunion didn't make things any easier. But I wanted to let you know your words on that post made me see things so much clearer. I love you for that....among other things! So much Fun!!! 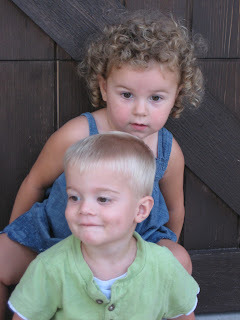 I absolutely love that pic of Ans and Noah - Adorable! Come back anytime, we always love being with you! pheww--i'm tired just looking at your pics! what an awesome-fun-filled-whirlwind trip! and what better place than A-town! love you and SOOOOO glad you guys had a blast. 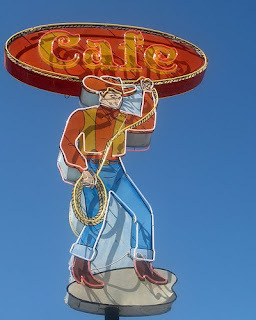 we are going to have to check out nutty browns (i must admit, i was laughing at the name and description with the giant birdcage and talking parrot! you gotta be kiddin' me?! love it). 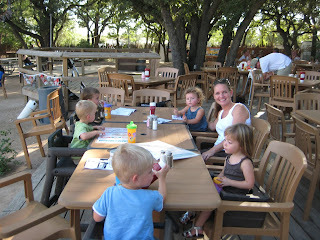 Hey, We were suppose to be at the Nutty Brown Cafe on Tuesday night with a group from our Subdivision. But ended up out of town... Sorry we missed you guys.